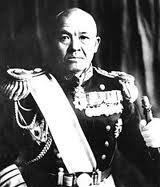 Chuichi Nagumo was born in 1886 and graduated from the Japanese Naval Academy in 1908. He was a torpedo specialist and had extensive seagoing experience. While commanding Japan's carrier striking force, he executed the December 7, 1941 Attack on Pearl Harbor and January-April 1942 raids in the South Pacific and the Indian Ocean. His force was decisively defeated on June 4, 1942, during the Battle of Midway, losing all four carriers at present. Vice Admiral Nagumo stayed the commander of the remaining Japanese aircraft carriers into November 1942, leading them in the Battle of the Eastern Solomons in August and the Battle of the Santa Cruz Islands in October. He was later placed in charge of naval forces in the Marianas Islands area. In keeping with Japanese military traditions. He died on his own hand on July 6, 1944, during the final stages of the defense battles of Saipan.